Technology is changing the way people connect, and there are countless new ways for storytellers to build exciting, future-proof careers. What does New Media really mean, and how can it be leveraged as an effective tool for connection? This discussion will dive into the world of experiential technologies and the ways organizations are using tech to connect with audiences through immersive, impactful storytelling. We’ll explore everything from 360 video to virtual reality with professionals sharing different perspectives and experiences, from cutting edge creative agencies to traditional media outlets. Discover how these technologies are opening up new career paths for creatives, artists, coders, marketers, and more. Storytellers of all kinds will walk away with inspiration and tools to make their next career move future-ready. 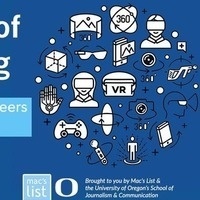 Join us for an evening of expert discussion, Q&A, and professional networking, hosted by University of Oregon School of Journalism and Communication and moderated by Mac’s List's Mac Prichard. For SOJC students only, use the promocode: SOJCSTUDENT. Bring your student ID. Pick up your complimentary paperback copy of "Land Your Dream Job in Portland (and Beyond)" at the event. It's the step-by-step insider's guide to finding meaningful and rewarding work here in Portland!